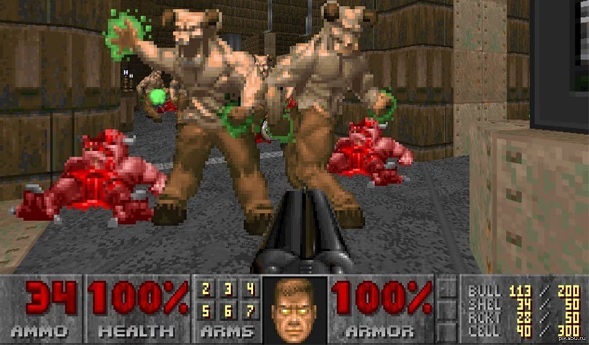 As part of a study to improve procedural level generation in games, three researchers have trained an artificial intelligence to make playable maps for classic Doom. We’re pretty sure this is how Skynet got started. Edoardo Giacomello, Pier Luca Lanzi, and Daniele Loiacono of Cornell University used Generative Adversarial Networks (GANs), a class of AI algorithms used in unsupervised machine learning. They provided two of these GANs with topographical features and images from over 1000 Doom maps, taken from community sites such as the Video Game Level Corpus on GitHub. As to the quality of the created maps, they claim that “most generated levels have proven to be interesting to explore and play due to the presence of typical features of Doom maps (like narrow tunnels and large rooms)”. Sadly, they have not made any of the AI-developed levels available. You can download and read the full study here. Their goal is to improve procedural generation systems to allow developers to put together levels more easily, and so cut development costs. So nothing about enslaving humanity as of yet.